Council voted to issue the development permit for this project on May 28, 2018. This application was presented to Council, where they voted to adopt the relevant bylaw amendments and issue a development permit. View the staff report with recommendations in the 'Related documents and web pages' tab. This application was presented to Council for second and third reading. Read the staff report with recommendation in the 'Related documents and web pages' tab. This application was presented at a public hearing. A public hearing is your chance to speak to Council if you feel your interest in property will be affected by the application. The detailed application was given First Reading at Council, and has been referred to a public hearing. The applicant hosted a public information meeting, which we require as part of the application process. This was an opportunity for area residents to ask questions and share their thoughts. Staff have received the detailed application from the developer, and are currently reviewing it. They expect to refer the application to the Advisory Design Panel (ADP) in October or November, 2016. At our request, the developer held an early input meeting, to share their preliminary proposal for their development with community members and gather feedback. 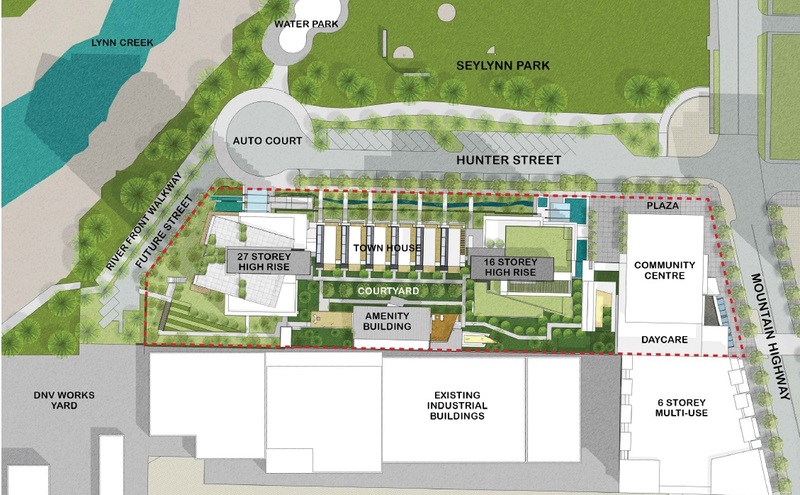 The development site is a large, flat property occupied by several light industrial buildings located on the south side of Hunter Street. Lynn Creek is located west of the site, Seylynn Park is across the street to the north, and Mountain Highway borders the property to the east. The area of the site is approximately 2.01 acres (91,557 sq ft). The Official Community Plan (OCP) and the Lynn Creek Town Center Implementation Plan designate this site as Commercial Residential Mixed Use Level 3. This allows for a maximum floor space ratio (FSR) of 3.5. The floor space ratio (FSR) is approximately 3.5 (excluding the community centre). 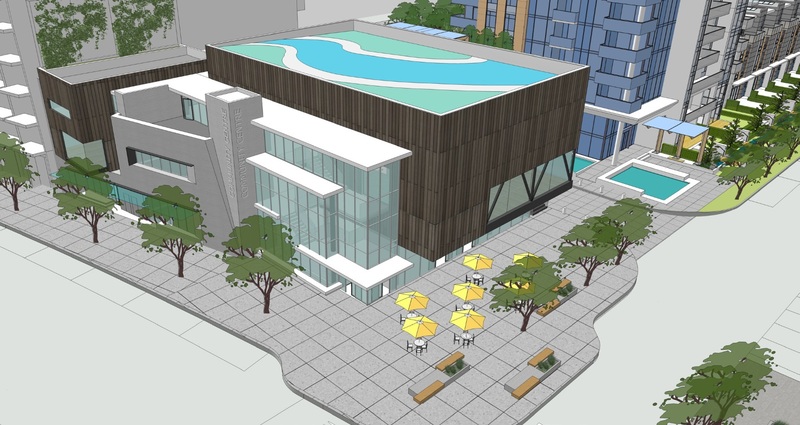 In addition to the community centre, this development will also include a public plaza, and there is the possibility of public art (provided by the developer). Improvements will be made to the road and sidewalk along Hunter Street and Mountain Highway to enhance pedestrian and vehicle access. The developer will also construct a paved multi-use path along Lynn Creek next to the development site. 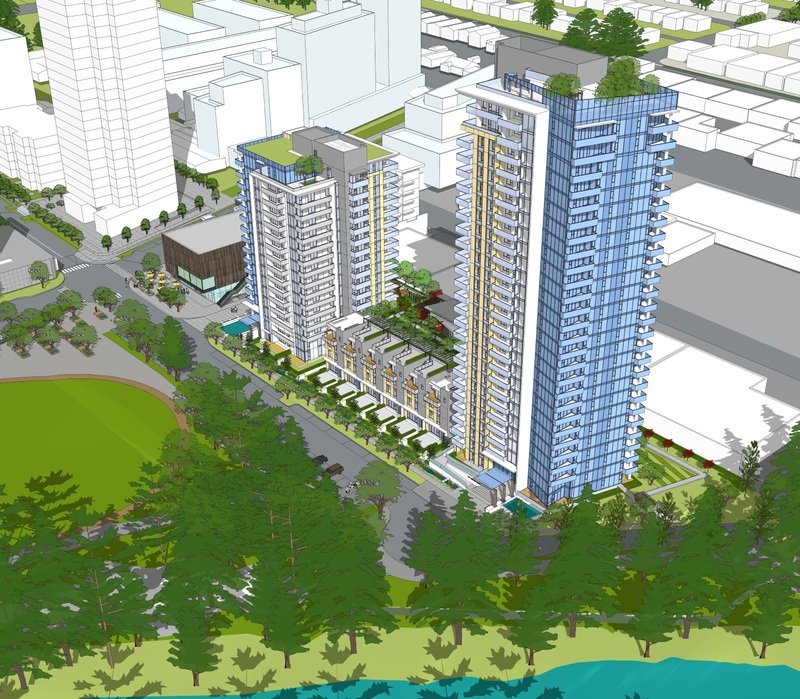 Lynn Creek Town Centre will be a transit-oriented, mixed use community offering a wide-range of housing options for people at all stages of life.